2.Sign up an account and remember your password. 3.Plug the power adapter of this camera. 4. After it is ready, please log in your account, click "+" to add your wifi camera, scan the QR code and follow the voice from the camera to install your camera. 1. The camera is only support 2.4G WIFI instead of 5G WIFI. Please check WIFI frequency band of the WIFI router. 2. In order to make the WIFI camera online, please keep your WIFI/ethernet network work normally. 3. Not recommended for outdoor camera or waterproof camera. E-mail us via our support email address( it will show on our Aftersale card and our website). ✔ HD 720p, Top image capture by high-quality optics, auto white balance and exposure.Sharp and contrast-rich night vision, IR auto switch,multiple preset position support, you can define the position when specific event occurs or time trigger,motion detect. ✔Clear Two Way Audio: Built-in Mic, speaker and anti-noise filter in this ip camera provide you a clear experience of two way talk. 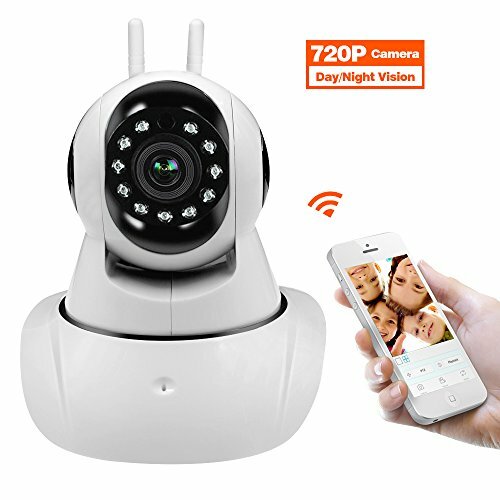 Even you are out, you can remote control this wireless surveillance camera and stay in touch with your kids, pets, family and so on. ✔Motion Detection & Alarm Push & Recording: Automatically detect moving objects and alarm push to your smart phone via notification. Support Onvif. Micro SD card (Built-in Micro SD Slot, Max 64 GB supported, SD card is not included) for recording, storing and reviewing. If you have any questions about this product by Amorvue, contact us by completing and submitting the form below. If you are looking for a specif part number, please include it with your message.